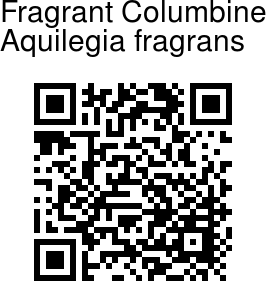 Fragrant Columbine is a delightful Columbine from the Himalayas. Nodding, creamy flowers have a hint of lavender in the petals and have a rich, honeysuckle scent. Rootstock is slender, covered by leaf-stalks of former year in its uppermost part. Stems are 30-80 cm high, branched, with a few spreading hairs near the base, densely hairy with glands below the flowers. Basal leaves are 2-3-ternate with long hairy stalks. Leaflets are wedge-shaped to obovate, glaucous, paler and hairy beneath, green and usually hairless above, 2-3-lobed almost to the base; segments lobed again, 2-4 cm long and wide. Stem leaves are gradually reduced in size and partition from the base upwards, the uppermost bract-like with 1-3 lanceshaped, long-pointed segments. Flowers are several, somewhat horizontal to slightly nodding. Sepals are 20-30 x 9-12 mm, whitish to purple, slightly velvety, blunt to pointed. Lamina of petals truncate, 1.5-1.8 x 0.8-1.4 cm, usually paler than sepals, hairy; spur straight or slightly curved, 1.5-1.8 cm long, about 3 mm wide near base. Follicles are 5-9, 1.5-2 cm long, densely velvety with or without glandular hairs. 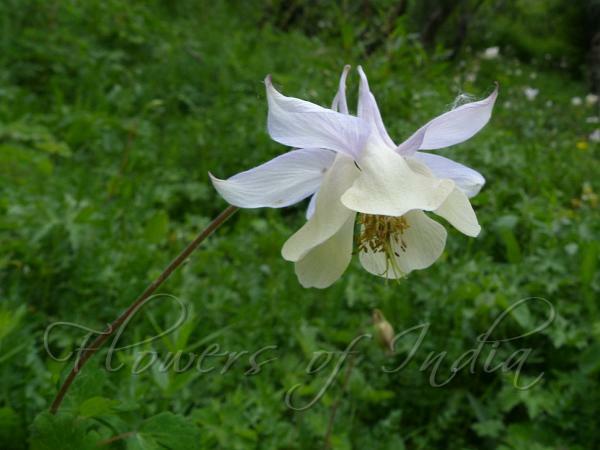 Fragrant Columbine is found at higher altitudes from NW Frontier Province to Kashmir and Himachal Pradesh, at altitudes of 2400-3600 m. Flowering: June-August. Identification credit: Narendra Joshi Photographed in Lahaul, HP & Ladakh.